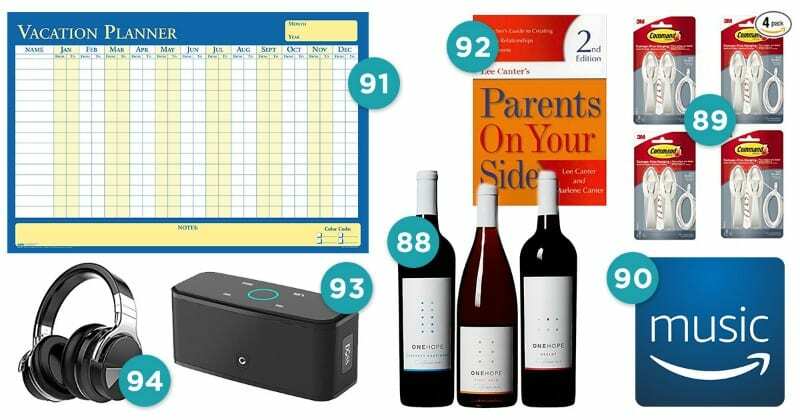 Pretty much everything you’d need in a classroom. 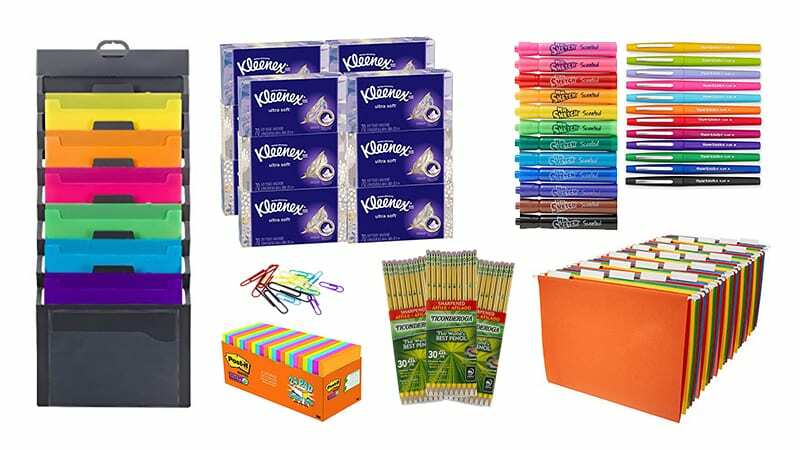 Every educator has their must-have supplies for their classroom (and themselves) to make it through the school year . 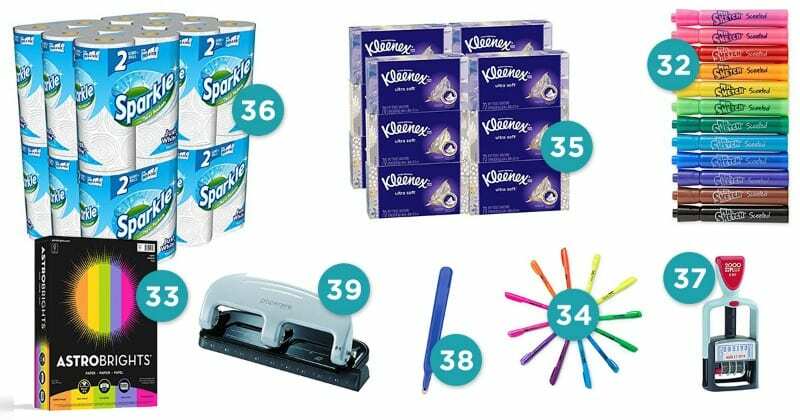 We’ve rounded up our favorite Amazon teacher supplies, from basic classroom supplies to sanity savers that make your day-to-day easier. See if your favorites made the list or find a few new goodies to add to your rotation. 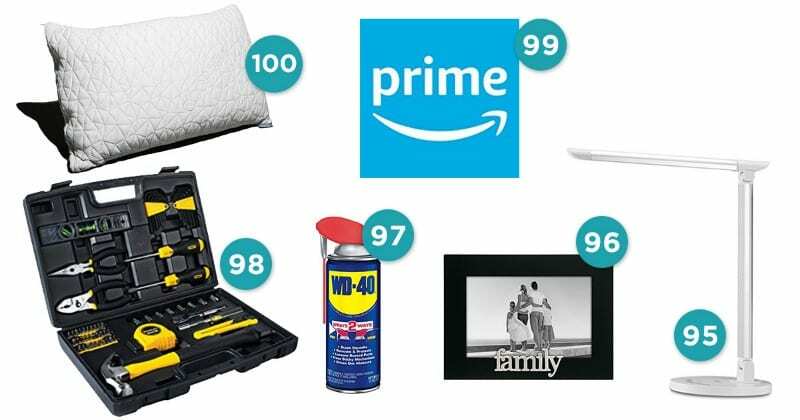 And check out some of our other favorite Amazon perks for teachers here. 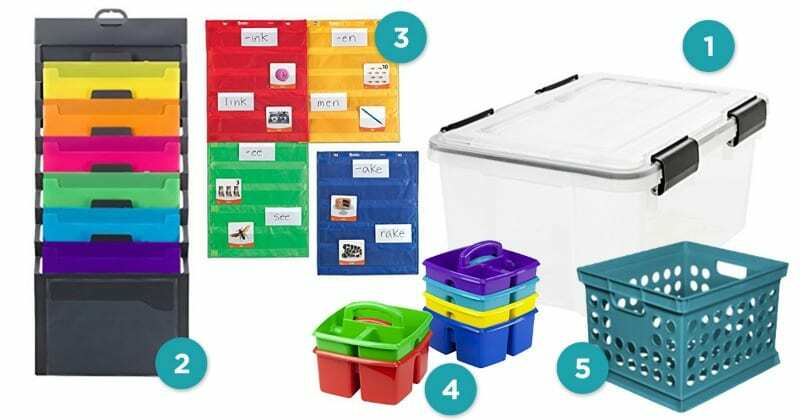 Here’s a home for supplies, binders, unit lessons and anything else that needs to stay together. For the files you need daily or weekly. Hang this by your desk for easy access and to keep curious minds away from it. These come in a variety of sizes and have an endless number of uses. The magnets on the back let you hang them on filing cabinets or white boards. Small buckets and bins like these keep pencils, markers, glue and other items grouped together in one spot and easy to access. Not every file will fit in a drawer. This is for the files you don’t need daily access to or to hang files your students need to get at. 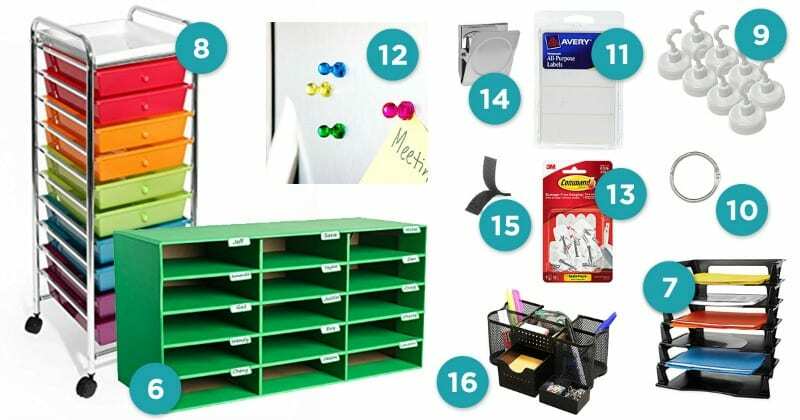 Perfect for primary grade teachers, this storage shelf provides each student with their own slot. All their take-home papers live there until they move them to their backpack. Students need a designated place to turn in their work and you need a spot for handouts to send home. These plastic baskets work great. Classrooms contain a bunch of people and a bunch of stuff for all those people. Having designated spots for all that stuff is a must, and lots of little drawers really help. Hang up laminated prompts, note cards on rings, clipboards and more. Keep related laminated sheets or note cards together, then hang them from one of your magnetic hooks (#9). Smack these on to folders, books or anything else that may need a label, ID tag or description attached to it. Hang posters and papers on filing cabinets or white boards with no mess or holes left behind. No need to put holes in the walls for the custodian to get upset about. Just stick these on instead. With strong magnets on the back and heavy-duty clips, you can hang even the heftiest of anchor charts. Another easy-peasy way to hang and attach things, and swap them out, too. 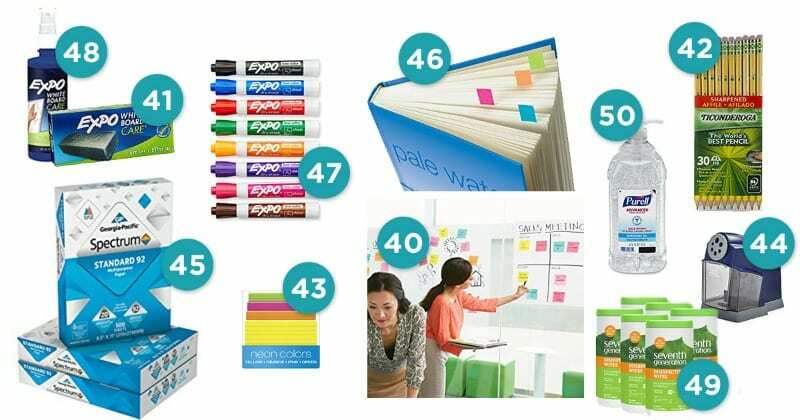 You’ll always know where to find your own pens, paper clips and Post Its. For those who like their plans on paper instead of (or along with) digitally. Recording grades with pen and paper is still the preferred way of doing it for many teachers. 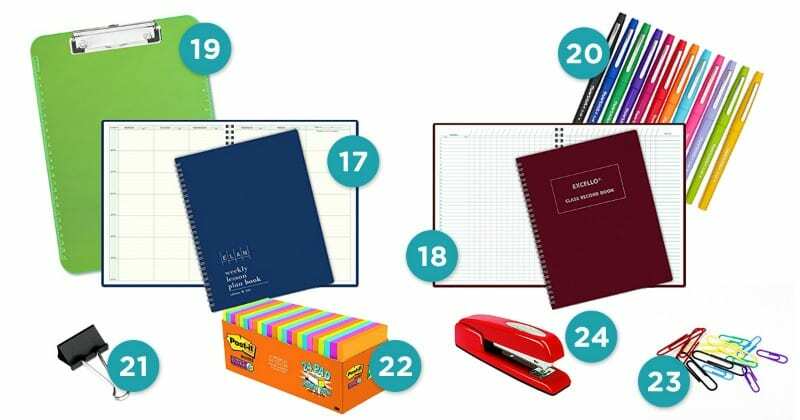 Keep your needed papers together in one spot and with you as you wander around the classroom or in the halls. A brightly colored one makes it easier to find after you set it down. You’ve got a lot of grading to do and notes to make, and this colorful assortment of felt-tip pens is a teacher favorite. See some of our other favorite pens here. Use them as place holders in lesson plans or textbooks or to hold open notebooks. For notes to students, notes to stick on charts, notes for coworkers, notes for parents or reminders to all of the above. For when a staple feels too permanent, and multicolored just for fun. Like Milton in Office Space, teachers know the significance of a great stapler. And of course, this one flips open for bulletin boards. Keep all those papers sorted and in their designated place. Whether you’re a classic-manila fan or love to color code, those hanging folders need some of these need matter what. For drawing straight lines on overhead graphs during math or any other time. Since it’s clear, students can still what’s going on beneath it. No need to dash to the office for a few copies. 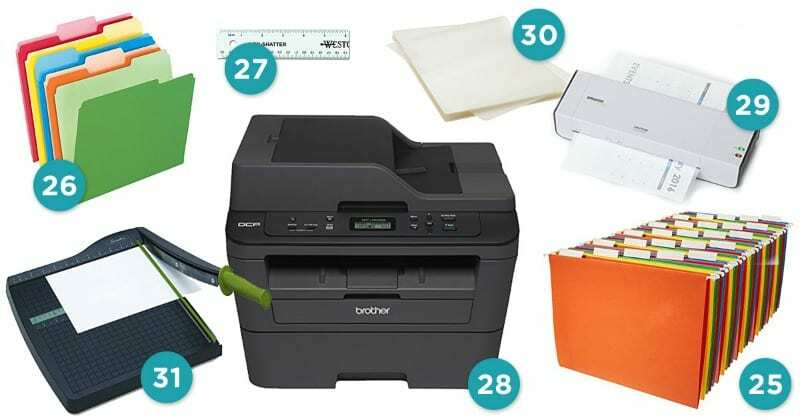 This wireless laser printer and scanner can do the work for you in your classroom. This is a splurge that quickly becomes worth it. It’s one less trip down to the office, saving you some time or from waiting in the laminating line. That personal laminator is no good without these. They work for letter-sized paper and smaller. Quickly slice through multiple sheets of paper from the comfort of your own classroom. For anchor charts or any other kind of chart you need, these markers are highly visible and smell great, too. Perfect for so many classroom needs and projects. Draw attention to text for yourself, a student, co-workers or parents. Because sniffles are rampant any time of year. Because spills and messy hands are rampant, too. So you don’t have to write it repeatedly and to provide documented evidence of homework due dates. Free bulletin boards of old staples quickly and without damage. Now almost anything can go in a three-ring binder. It’s like a giant Post-It. Use them to make charts or lists that need to be temporarily displayed in the room. Clear the board for the next round of great ideas or inspiring lessons. You’ll always need more pencils, and you’re one step ahead when they’re already sharpened. Once they’re filled out, these become study tools, ice breakers, games or a great place for notes. If you’re pro-electric pencil sharpener, this one’s tops. Of course, it needs to come with a set of classroom pencil sharpener rules so kids aren’t using it every five minutes. For printing on your personal printer or anytime you need a blank sheet of paper. Use these to mark pages in books or lesson plans. These are low-odor and chisel tip for maximum enjoyment. Erasers work well to clear white boards, but a spray-on cleaner can make it look like new. 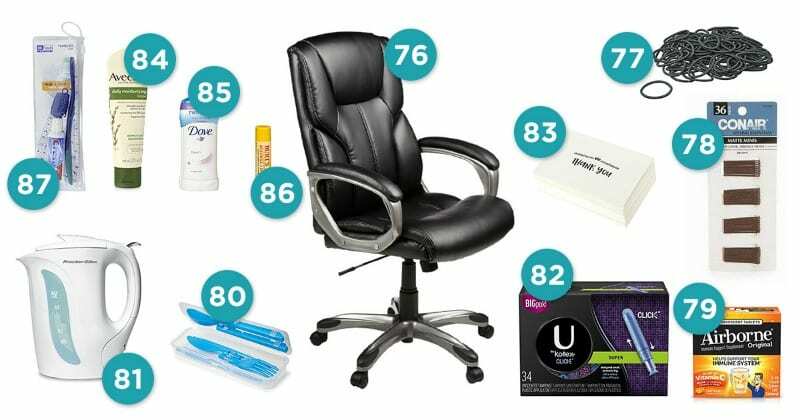 Quickly clean dirty desks, tables and non-carpeted floors. Let’s face it—trekking to the sink for hand washing isn’t always feasible, so use this to help keep colds and flu at bay. Keep kids and yourself on track with a simple timer that’s not your smartphone. 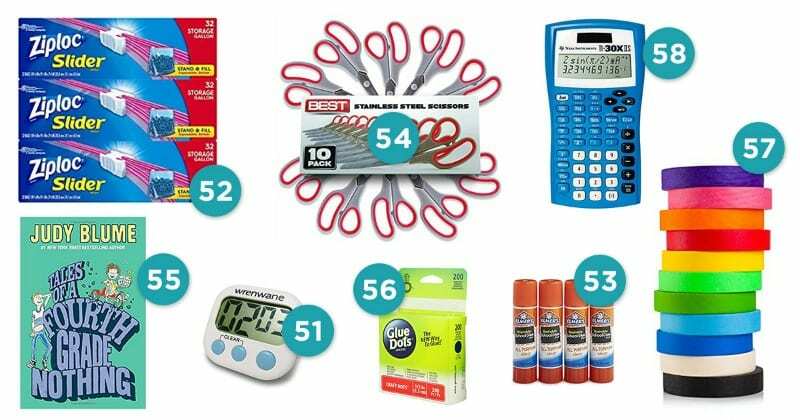 For leftover snacks, flash card storage and more. Glue that sticks and washes off. Get a bunch of extras cause they always seem to disappear. Depending on the grade you teach, you may need lots and lots of these and at different reading levels. An easy, mess-free way of permanently attaching things. An awesome alternative to glue sticks. Colored painter’s tape is a great way to create boxes and charts right on the white board or to hang things up in a snap without damaging walls. Maybe it’s just for you, or for your students, too, depending on what grade and subject you teach. These can be used to make three-dimensional graphs, as counters or for grouping. They’re quiet while students roll them during math lessons! Toss this around to designate the speaker during class discussions, for a quiet game of brain-break catch or during geography lessons. For kids that need to keep moving to stay focused and to give students some choice in the room. A blessing for any math center. No need to print zillions of copies when students can use one sheet over and over thanks to plastic covers and dry erase markers. 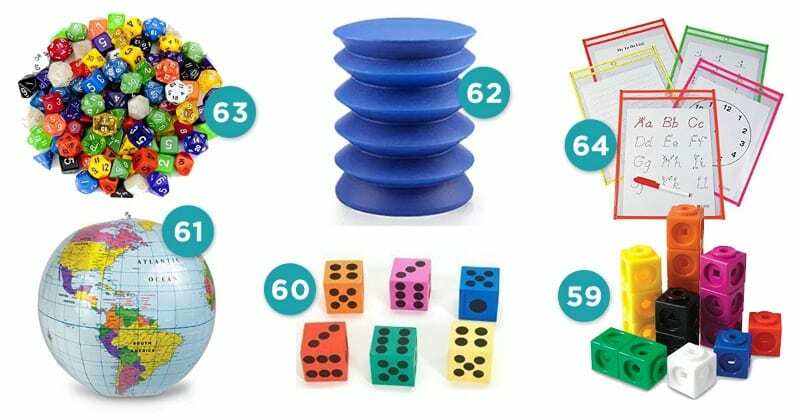 These are great for writing, math and on-the-spot assessments. 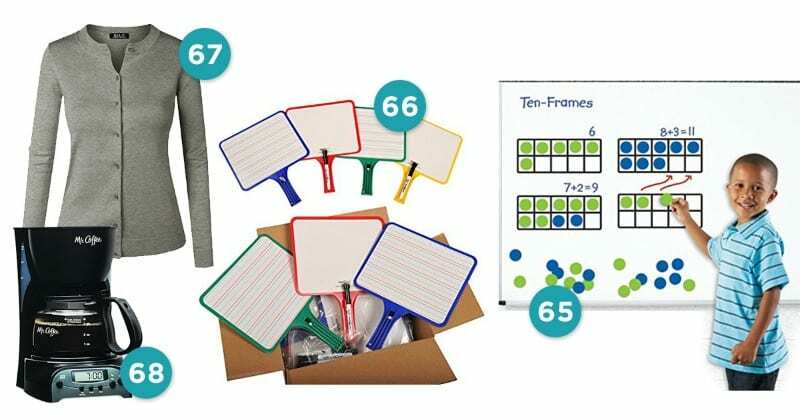 Large and easy to see, these are perfect for demonstrations, math centers or as a classroom math tool. Pass these out to students instead of paper for them to solve math problems, do group work or during class discussions. For when the heating system acts up. For our favorite teacher t-shirts you can buy on Amazon, click here. It’s hot and fresh anytime you want it. Keep your own stash for sick days or headache days. It never hurts to have different options when self-medicating. In case the ones you picked in the morning turn out to be a bad choice or your closet light is broken and you leave wearing one brown shoe and one black shoe. The one that magically holds all your stuff—papers, laptop, gym shoes, your lunch, etc. 73. Snacks. Like an entire drawer-full. No need to go to the store. Just have them delivered right to school. 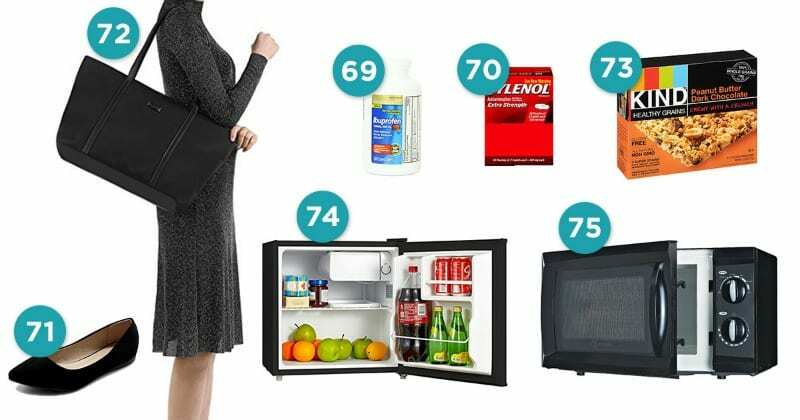 Lunch, snacks and drinks stay cool till you have a 10-minute break to scarf them down while working. Now it’s even easier to eat at your desk! You may not get to sit down often, but when you do, make it count with a soft place to land. For those moments when you need it out of your face and off your neck. Get bangs out of your face or keep loose strands tucked in. Try to stay healthy cause planning for a sub is hard. Sure there are extras in the teacher’s lounge, but yours will always be at the ready. Have hot water for tea or instant soup in minutes. Nice to have on hand to acknowledge gifts or favors. Lots of hand washing and sanitizer use dries skin out. This can help. In case you forget that morning or it’s time to reapply. For anytime lips feel chapped or dry. Your job requires you to talk a lot. Sometimes right by peoples’ faces. Nuff said. A glass to celebrate a well-done day of teaching. With the computer, fridge, laminator, lamp, microwave, etc. all living around your desk, you’ve got lots of cords to contain. Get yourself and/or your students ramped up or chilled out with help from free streaming music with an Amazon Prime membership. Beyond essential, time off helps teachers recharge and relax. Make the most of your vacation by filling this planner to the max or leaving it completely blank. If you’re having trouble connecting with parents, try this book or chat with your principal and co-workers for tips. Share playlists with the class right from your phone. Maybe it’s two minutes before your students land in your classroom or two minutes before you walk in the door at home. If you have to force that quiet before the first bell rings of while your car is parked in the driveway, try these. They also have a built-in mic for hands-free phone calls and provide great sound when listening to music. Whether it’s to give your desk some extra light or create a more cozy atmosphere in the classroom, a lamp is a great tool to have. Put photos up of friends or family and you. It’s a great way for students to learn about you, remember you have a life outside of school and brighten your day. Squeaky chair or desk? Take care of it quickly and prevent distractions with a spray of this. For those unexpected times when you need to tighten a screw driver or get at something tiny with a needle nose pliers. Free shipping + ordering almost anything online = totally amazing. Help yourself have the energy to educate lots of kids by getting enough rest. A top-rated pillow can do the trick.